July has been a quiet month on desserts for breakfast, but that doesn't mean it's been a quiet month in the kitchen! Quite the opposite--a whole week of mid-July was pretty much dedicated to churning out a set of wedding cakes! We had three stand mixers going, four pairs of hands in the kitchen, and went through mountains of butter and eggs, a Costco-sized bag of flour, and a whole lotta sugar.... whew! It's been a while since I last made a wedding cake, and now I remember full well why: because the recovery from attempting such a project in a small, non-commercial kitchen is almost as exhausting as making the cake itself. My dish rack is still piled with spatulas, mixing bowls, and piping tips that I have yet to get around to putting away. But, recovery is coming slowly, and even as I type, there's a sweet something chilling in the fridge that I'll hopefully get to share on the blog soon. I have to say that my favorite part of making a wedding cake is crafting the sugar flowers and decorating the final pieces. For this wedding, Helen and Evan--the bride and groom, and incidentally, my cousin and cousin-in-law!--had gotten married in Hawai'i a month ago and were having a separate reception here in San Francisco for extended family and friends. So for the reception decor, they wanted to tie in the tropical and Asian themes that were present at their wedding in Hawai'i: lush florals, bamboo accents, orchids, and a rustic, laid-back charm. So instead of one gigantic cake, I went for many cakes of different sizes to give the table a more casual feel. 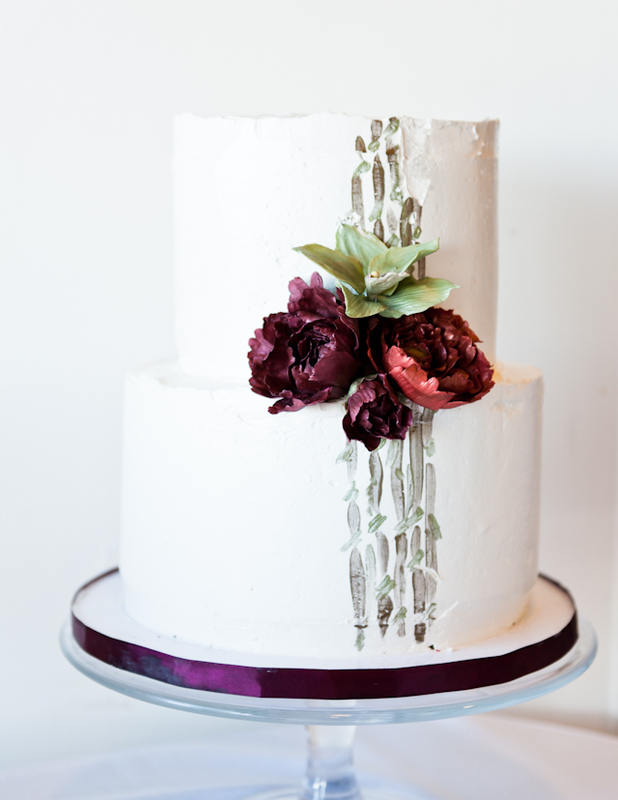 I decided to make a combination of royal and richly-colored peonies to emphasize the Asian feel, with punches of light green cymbidium orchids and hand-painted bamboo on the cakes for a uniting theme. I adore how the sugar flowers came out, even though each petal was cut, shaped, glued, painted, and glazed by hand so that every flower would be unique, like real peonies--*that* took forever. Oh--and each cake was a different flavor: chocolate, passionfruit, raspberry-mocha, and macadamia nut mocha crunch. A huge thanks to my best friend, Jessica, who pulled all-nighters with me to finish these cakes! and thanks to my parents who helped me transport them and clean up the disaster that was my kitchen afterwards. And, of course, a big congratulations to Helen and Evan! May you live long and prosper happily. 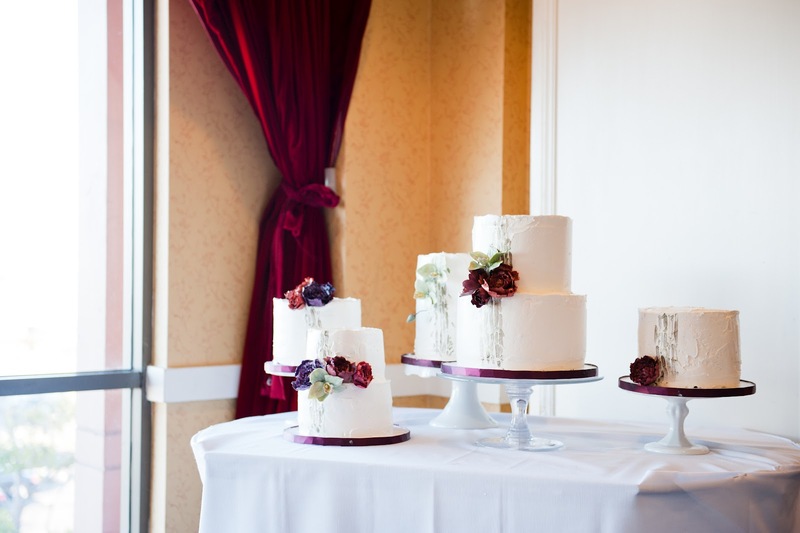 I'm glad you shared this post because those are some seriously gorgeous cakes ! Why did you hate the photos? I think they're beautiful! gorgeous cakes & the flowers are so awesome! Oh wow. Collect the whole set! Looks AMAZING. I tried my hand at making sugar flowers in pastry school and decided then that it was like making "dentelle bretonne" (lace from Brittany), it required a calling! Your flowers are just beautiful and deserve an accolade. The cakes are stunning and so elegant. Fantastic job! I'm sooo glad you decided to share these beautiful creations with us. These cakes are original and stunning! Fabulous! You did an amazing job. The cakes look beautiful. Thank you for sharing the photos. Those cakes, flowers AND pictures are beautiful!! Thanks for sharing. 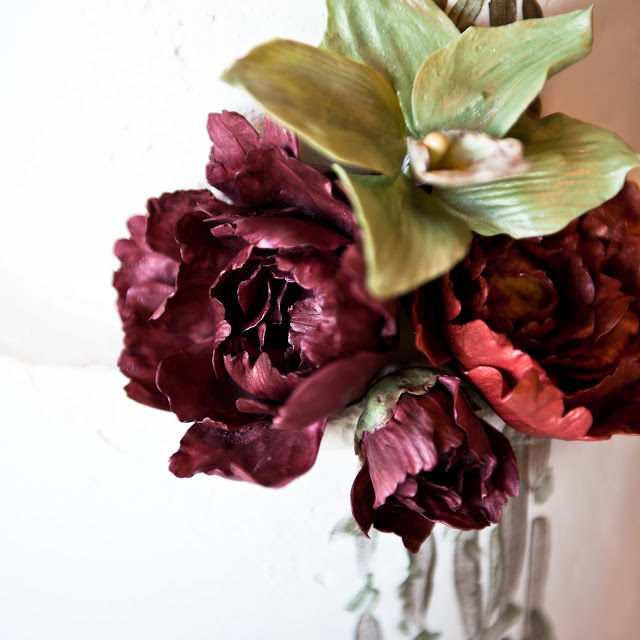 I am baffled that you actually MADE those peonies; I can't imagine the process. They look so realistic and beautiful! Wow! I don't even know what more to say. The cakes are absolutely beautiful, and I bet they taste even better. Also, I am AMAZED that those are sugar flowers. When I first opened the post, I thought to myself, "I wonder if you have to do research to determine what kind of flowers you can put on cakes." Then, I read the part about how you meticulously made the sugar flowers. I had to read that part twice and scroll back through the photos to witness again how perfect they are. Wedding photography is indeed a skill, and I think you executed it just fine! Silly you, the photos are gorgeous! Can't wait to try my hand at edible flower making. Thanks! Are you kidding? Those flowers are sugar?! Incredible. Really fantastic work; you can't possibly be more thrilled. Hey Stephanie, would you ever consider doing a post about assembling and preparing the wedding cakes you make? As a home baker who will be going through the same process as you, I feel like it would be really useful! An amazing work, especially the sugar flowers, they look sooo realistic ! Woah! WOW, the peonies (and orchids) came out wonderfully! They look so meticulously made. Your cousin is one lucky lady. These are beautiful! You should be very proud! I don't know if you've ever heard of Maggie Austin cakes (http://maggieaustincake.com/), but your sugar flowers remind me of hers- amazing! These are beautiful! You should be proud! I don't know if you've ever heard of Maggie Austin Cakes (www.maggieaustincake.com), but your sugar flowers remind me of yours- amazing! Wow! 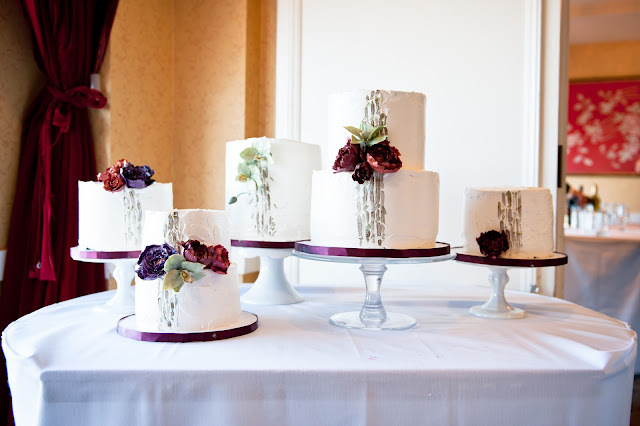 I'm so glad you shared these cakes because they are truly stunning! I'm utterly in awe of the flowers – they look so realistic and beautiful. 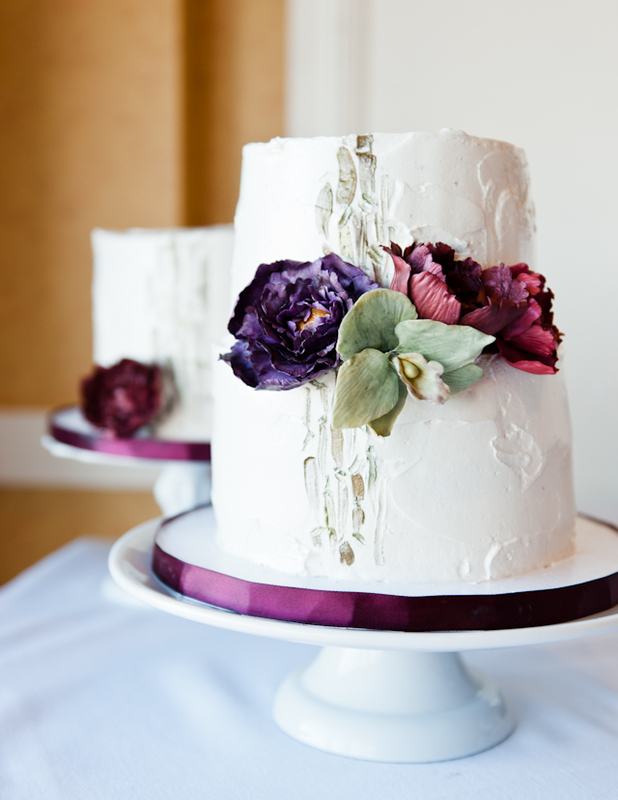 I love the colours as well, and the simple bamboo detail painted onto the cakes is just so effective. Wow you MADE those flowers?! They are stunningly realistic, you've definitely got a talent there! The flavours sound incredible too. This is the coolest cake I've seen in FOREVER, and I should know since I've been art directing a wedding magazine for the past 5 years. Wow, wow, wow. Sugar flowers? You are a talented one miss Stephanie. Oh, I have heard of Maggie Austin--her cakes are just drop-dead amazing! I'm with everyone else who can't believe how perfectly crafted those flowers are. Absolutely lovely. I am speechless at those flowers! Never in my life have I seen sugar flowers like that. You are so talented. Thank you for posting! 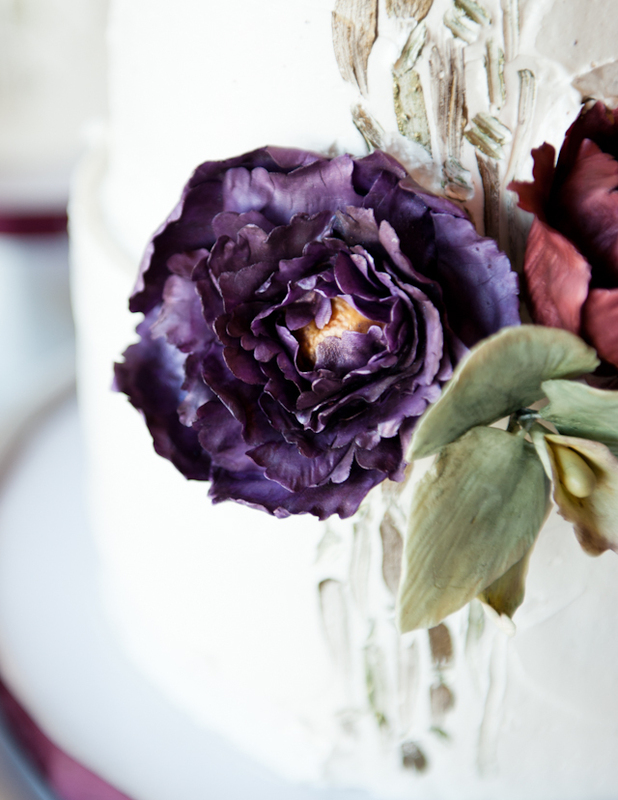 The flowers are INCREDIBLE, and I love the simple, elegant cakes on which they sit. The flavors sound amazing - mac mocha crunch? Yum! I'm glad you posted despite your hesitation because those are some beautiful cakes!!! I'm making my first ever wedding cakes very, very soon. Do you have a guide you use for numbers of servings?